The top Republican in the House of Representatives took aim Tuesday at proposals to regionalize school districts and expand the sales tax. House Minority Leader Themis Klarides, R-Derby, challenged Gov. Ned Lamont and his fellow Democrats in the legislature’s majority to focus more on options to reduce government spending. Democrats regained control of the Senate and expanded their advantage in the House of Representatives by making big gains in last November’s elections. For example, Klarides said, she represents a portion of the Amity Regional School District, which serves students from Bethany, Orange and Woodbridge. These communities also share social services, chambers of commerce and civic groups. One bill introduced by Senate President Pro Tem Martin M. Looney, D-New Haven, would require communities with populations of less than 40,000 to consolidate with another school district. A second measure, offered by Senate Majority Leader Bob Duff, D-Norwalk, and Sen. Cathy Osten, D-Sprague, would direct any district with fewer than 2,000 students to merge with at least one more so that the expanded district’s student population exceeds 2,000. If a community did not wish to do so, it would have to explain its hardship in writing to the state Department of Education. The Senate Democratic Caucus did not comment immediately after Klarides issued her statements. But Looney put legislators and others on notice when the 2019 session convened on Jan. 9 that a more aggressive approach to consolidation would have to be considered. Surging state pension and other debt costs have weakened state aid for schools in recent years and are projected to place increasing pressure on state finances at least into the early 2030s. Nonpartisan fiscal analysts already have warned about major projected deficits for the next two-year state budget. Finances, unless adjusted, are on pace to run $1.5 billion in the red in the 2019-20 fiscal year. And the potential deficit reaches $2 billion the year after that. Lamont, whose first biennial budget proposal is due to legislators on Feb. 20, has asked his budget staff to research ending several longstanding sales tax exemptions — including those on groceries and medications — and mitigating this somewhat by reducing the overall 6.35 percent sales tax rate. Klarides said her office has received numerous phone calls and emails from constituents since this first was reported on Monday. Klarides said taxing groceries is a “nonstarter” for her caucus. The governor’s office did not comment immediately after Klarides’ press conference. But besides trying to close the deficit, Lamont also has said he wants to freeze state income tax rates and deliver property tax relief to lower- and middle-income families by expanding the property tax credit within the income tax system. 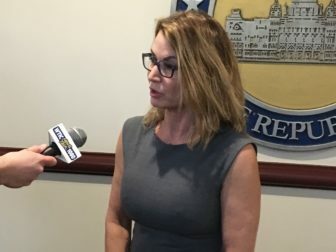 Klarides also objected to a bill introduced by Looney that would add one-half of 1 percentage point to the 6.35 percent sales tax rate, and dedicate the additional revenue to cities and towns. Keith M. Phaneuf Keith, with Jacqueline Rabe Thomas, won first prize in investigative reporting from the Education Writers Association in 2012 for a series of stories on the Board of Regents for Higher Education. The former State Capitol bureau chief for The Journal Inquirer of Manchester, Keith has spent most of 24 years as a reporter specializing in state government finances, analyzing such topics as income tax equity, waste in government and the complex funding systems behind Connecticut's transportation and social services networks. A former contributing writer to The New York Times, Keith is a graduate of and a former journalism instructor at the University of Connecticut. Connecticut lost 1,300 jobs in March as its unemployment rate rose from 3.8 percent to 3.9 percent, the state reported Thursday. A new proposal by Democratic lawmakers to hike taxes on the capital gains of Connecticut’s wealthiest sets up a showdown with Gov. Ned Lamont. Who pays the next CT tax hike? Democrats must answer question soon. None of the options are good for Democrats, who must decide whether to spread additional tax pain to low and middle-income residents or ask the state's wealthiest to pay more. Workers at state nursing homes want the legislature to budget an estimated $40 million for raises. State analysts also warned that the wage hike could add nearly $7 million in expenses to child care providers who participate in the state’s Care4Kids program.